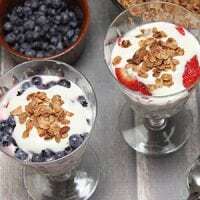 Guess how easy it is to make yogurt parfaits? As long as there's yogurt, a selection of fruits, and some crunchy granola or nuts, you've got everything you need! If you have multiple fruits and a few flavored yogurts, put everything into little bowls and set up your very own sundae bar — without all the sugar. For a dairy-free version, use a dairy-free alternative like coconut milk kefir. Or for a completely sugar-free dessert, keep your yogurt plain. With this array of healthy ingredients, you can easily serve it for breakfast as well. As long as there's yogurt, a selection of fruits, and some crunchy granola or nuts, you've got everything you need to make a yogurt parfait! Put yogurt, fruit, granola, nuts, seeds, and coconut out on the counter. Give kids parfait glasses and show them how to layer the yogurt and fruit. This depends on how deep your parfait glasses are, but I usually aim for 3 layers of yogurt, 2 layers of fruit, and a sprinkle of something crunchy on top. Once fruit and yogurt are layered, sprinkle with the granola, nuts, seeds, or coconut. Enjoy your custom-created snack or dessert! Pssst! Want your kids to be more involved in the kitchen? Check out our Real Food Kids eCourse to learn how to get your kids in the kitchen with you and start learning valuable life skills! They will learn how to make meals, snacks, and desserts for the whole family to enjoy, how to safely use knives, and how to properly handle food. 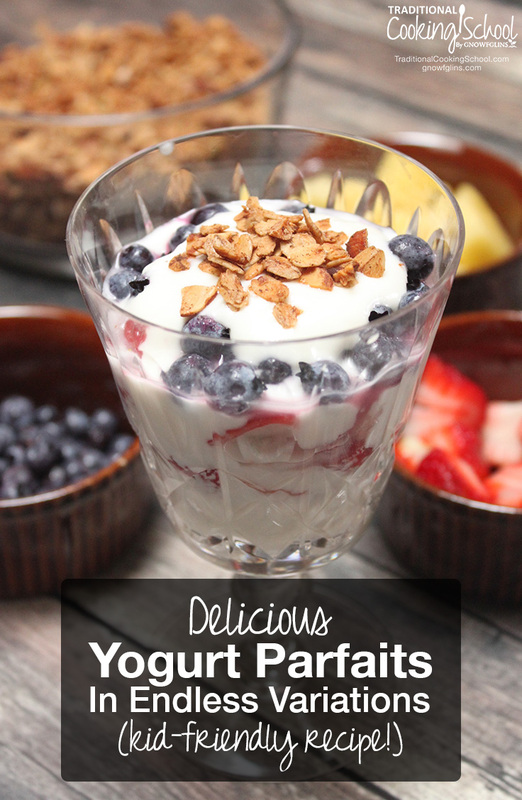 Have you ever made yogurt parfaits? How are your kids involved in the kitchen? Do they have favorite recipes they like to help with? 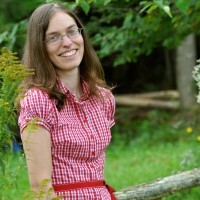 This post was featured in 24 Easy Summer Treats Kids Can Make Themselves.